Err on the side of play rather than work. If you approach life with a spirit of adventure and remember that old forms always, sooner or later, give way to new ones, you can create those new ones as a conscious gesture. At the same time, you can approach the puzzle of your life as precisely that. 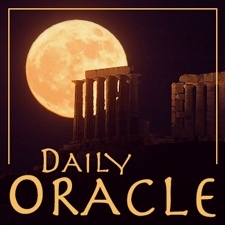 Today’s Oracle takes us to the Leo monthly for December 2008. Err on the side of play rather than work. If you approach life with a spirit of adventure and remember that old forms always, sooner or later, give way to new ones, you can create those new ones as a conscious gesture. At the same time, you can approach the puzzle of your life as precisely that. It’s just that the pieces will fit together in a whole new way other than you were expecting. Meanwhile, stay close to your original idea, the idea that didn’t care how or even if you got there; the one that was based entirely on vision, inspiration or a sense of destiny.